My "S" word for today can bring a smile to your face but it can also be annoying, if it get in your pants?? It is "SAND" and this shot was taken when I was walking along the beach in Cairns. It's my version of an artistic photo. 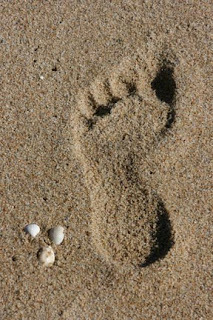 Anyone who knows me well would know that it's definately not my footprint - I have flat feet and if it was my foot impression there would be no nice arch!! Thank all for you lovely comments and I am feeling a little better thanks - I hate colds. Hi Davine, you're right - this is artistic and would look good framed on a wall. Sand is annoying when it gets stuck in my sneakers or sandals. Glad to hear you are feeling a little better. Gorgeous photo,Davine. Fabulous story, too. I still have a smile on my face!